Getting trapped is one of the unexpected hazards of location photography. I guess it is down to the fact that you do get to access some places that most people rarely get to go. It has happened three times to me recently. First whilst making one of those lovely architectural twilight shots of a new school I found myself locked in the school grounds after hours. As a recent design, the site was very effectively secured as I found out. On that occasion I was able to attract the attention of a cleaner who effected a rescue. Second, having spent some time at level 15 of a tower block construction site we found the door to the darkened stairwell padlocked from the outside at ground level. We wondered how long our torch batteries would last. Luckily I was accompanied by the Site Manager who was able to arrange for an Assistant to come and free us from captivity. 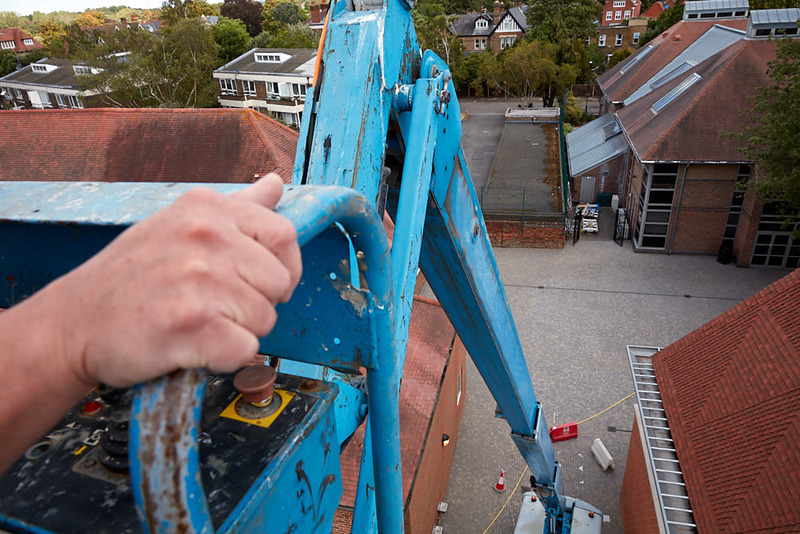 Thirdly, whilst shooting a new installation of glazed roofing at a school in Wimbledon the cherry-picker I was using to gain an aerial view stopped responding to its controls. The pic accompanying this post shows the fist of the operator nervously clutching the cage as it rocked helpless in the wind. Luckily my good humor outlasted the minutes it took for the machine to reset and start working again. Once back at ground level the operator revealed that this was not the first time the cherry-picker had done this to him. Perhaps that is why he looked so worried. Health and Safety is always a high priority and none of these incidents came close to causing any risk – For many projects I produce a Risk Assessment and Method Statement which serve to plan for risks both anticipated and unexpected.